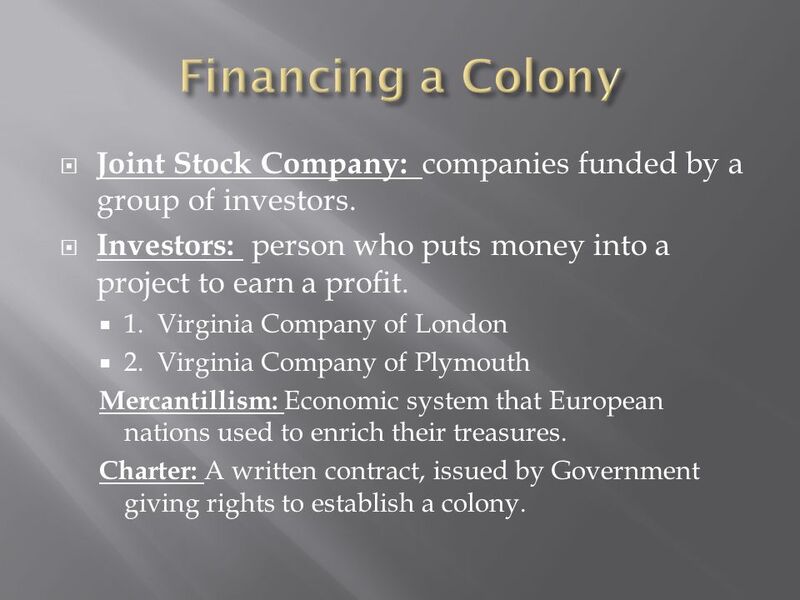 4 Financing a Colony Joint Stock Company: companies funded by a group of investors. Investors: person who puts money into a project to earn a profit. 1. Virginia Company of London 2. Virginia Company of Plymouth Mercantillism: Economic system that European nations used to enrich their treasures. Charter: A written contract, issued by Government giving rights to establish a colony. 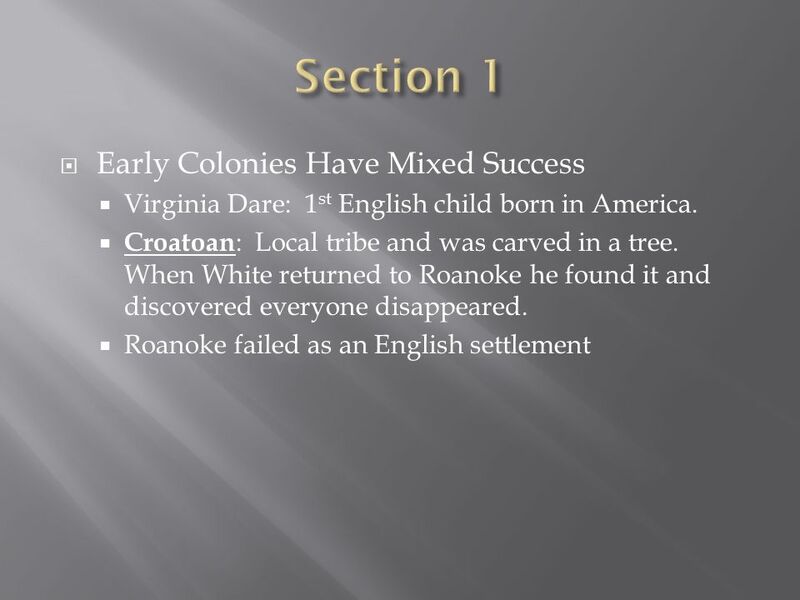 6 Powhatan Tribe: Trade with colonists but still had an intense relationship. 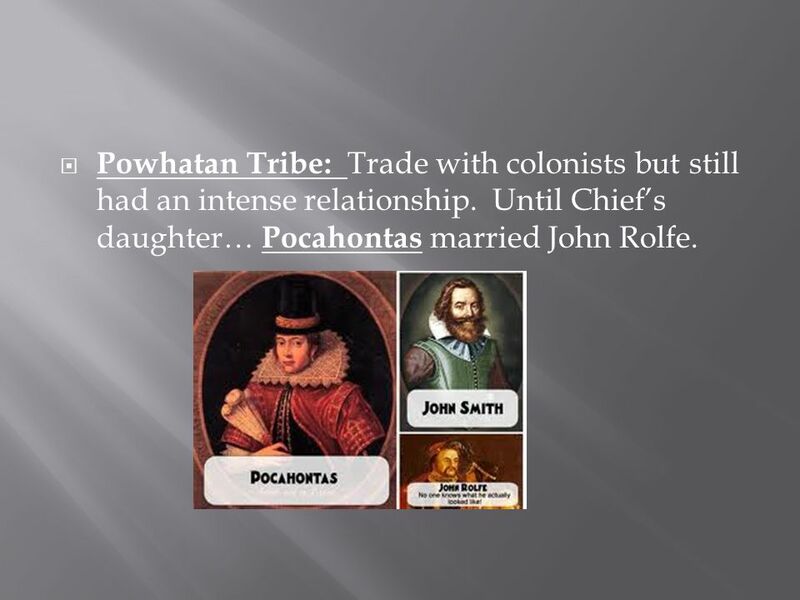 Until Chief’s daughter… Pocahontas married John Rolfe. 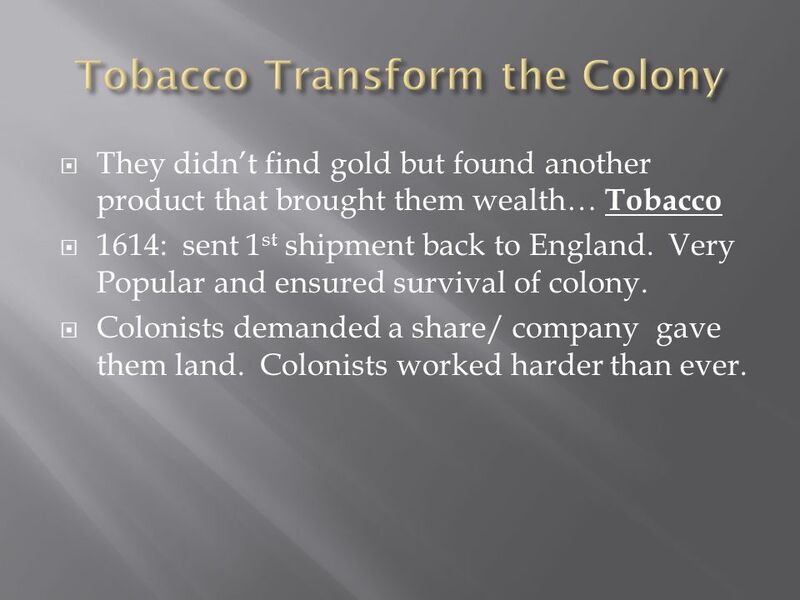 They didn’t find gold but found another product that brought them wealth… Tobacco 1614: sent 1st shipment back to England. Very Popular and ensured survival of colony. Colonists demanded a share/ company gave them land. 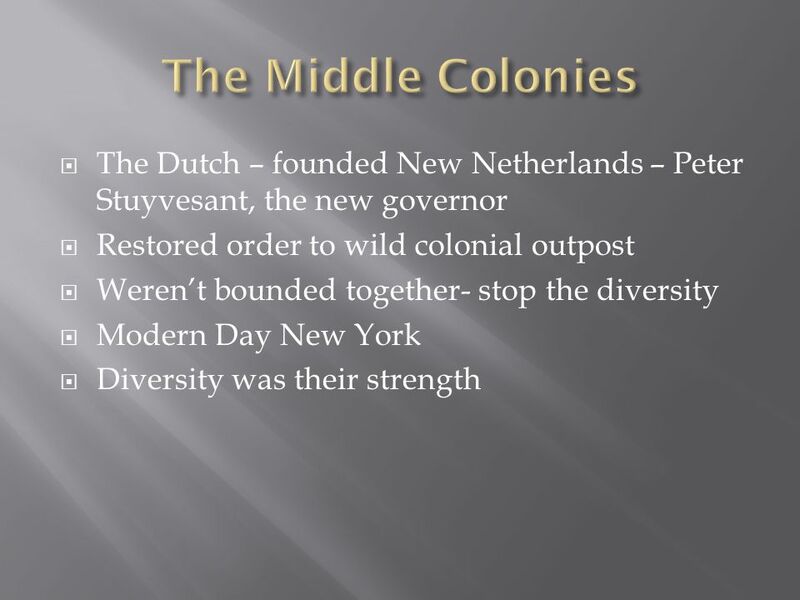 Colonists worked harder than ever. 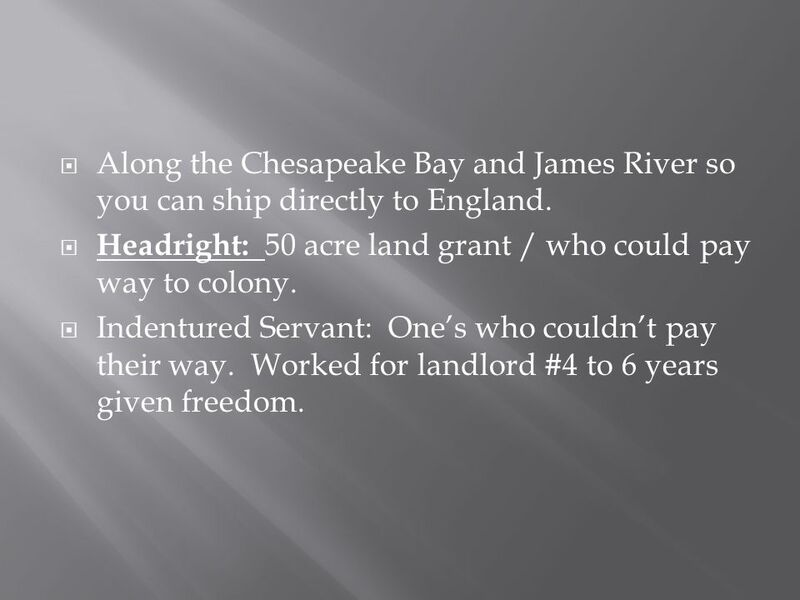 8 Along the Chesapeake Bay and James River so you can ship directly to England. Headright: 50 acre land grant / who could pay way to colony. 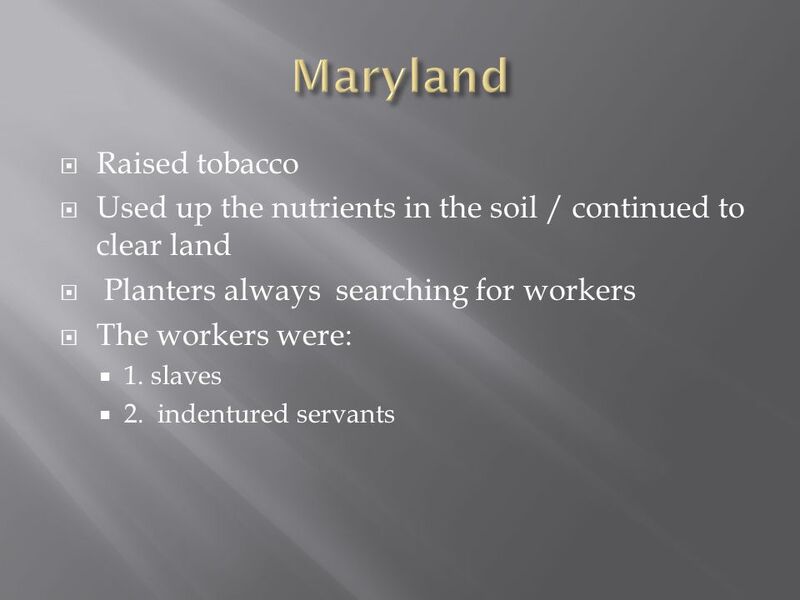 Indentured Servant: One’s who couldn’t pay their way. Worked for landlord #4 to 6 years given freedom. st representative assembly in colonies. 1. Passed Local Laws 2. 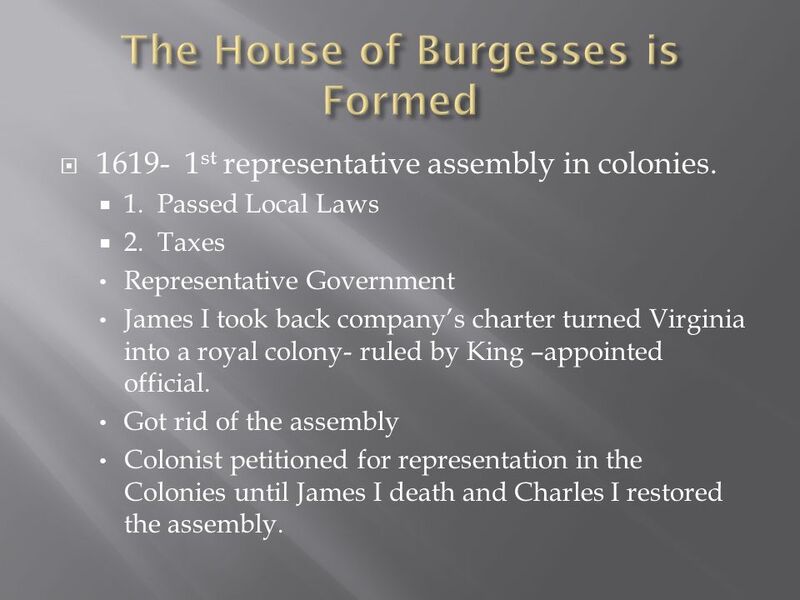 Taxes Representative Government James I took back company’s charter turned Virginia into a royal colony- ruled by King –appointed official. Got rid of the assembly Colonist petitioned for representation in the Colonies until James I death and Charles I restored the assembly. 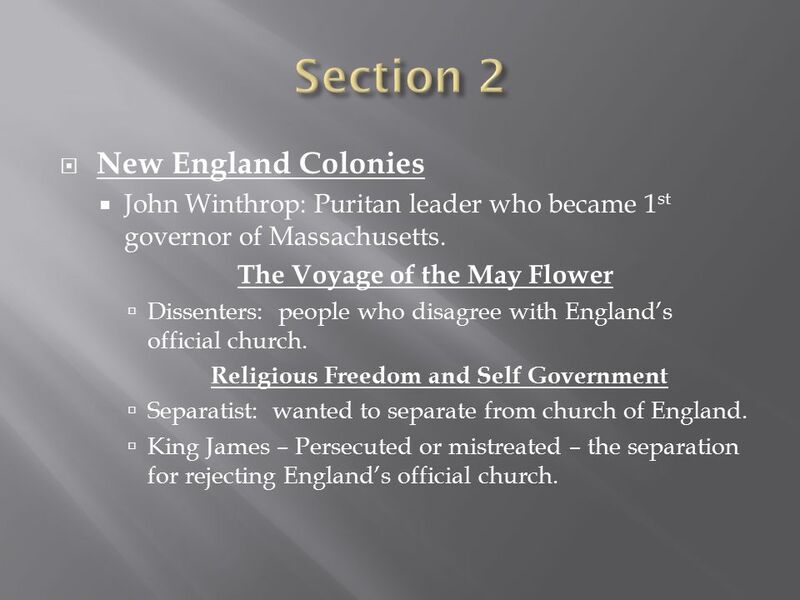 Section 2 New England Colonies John Winthrop: Puritan leader who became 1st governor of Massachusetts. The Voyage of the May Flower Dissenters: people who disagree with England’s official church. 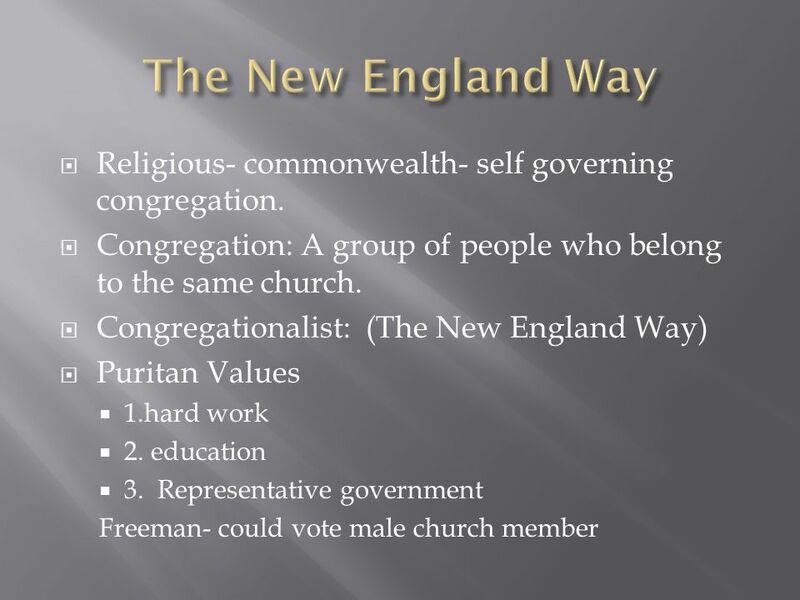 Religious Freedom and Self Government Separatist: wanted to separate from church of England. King James – Persecuted or mistreated – the separation for rejecting England’s official church. 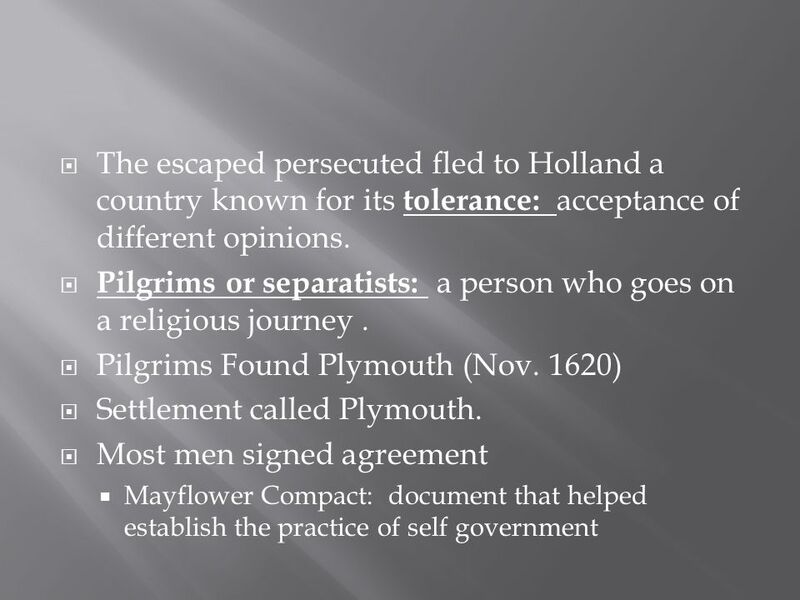 11 Pilgrims or separatists: a person who goes on a religious journey . 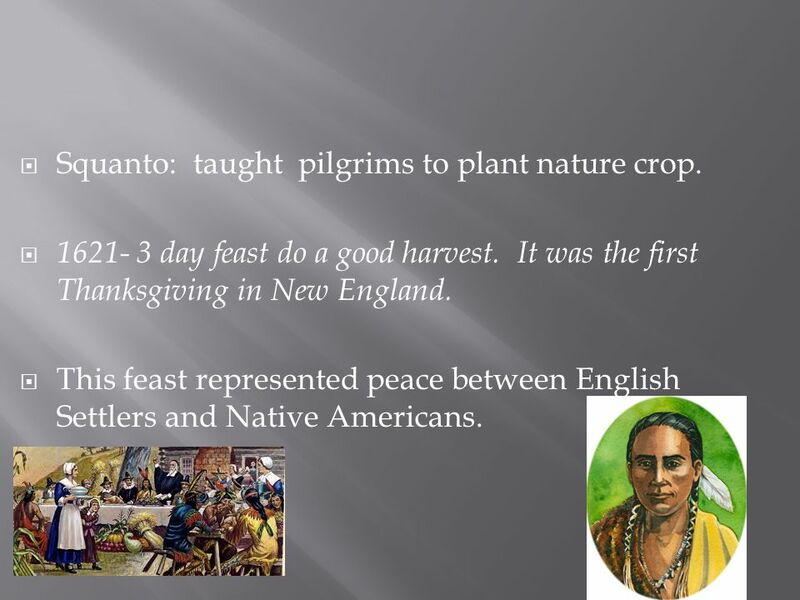 12 Squanto: taught pilgrims to plant nature crop. day feast do a good harvest. It was the first Thanksgiving in New England. This feast represented peace between English Settlers and Native Americans. Mass. 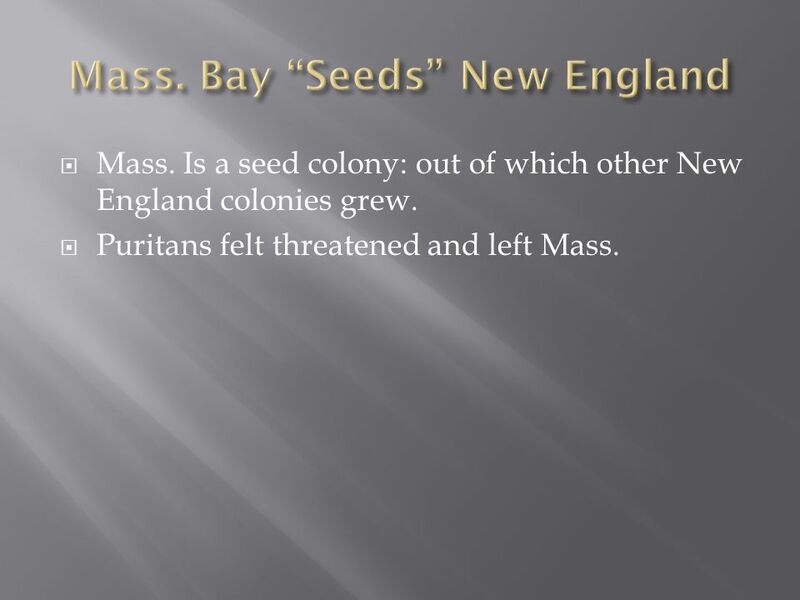 Is a seed colony: out of which other New England colonies grew. 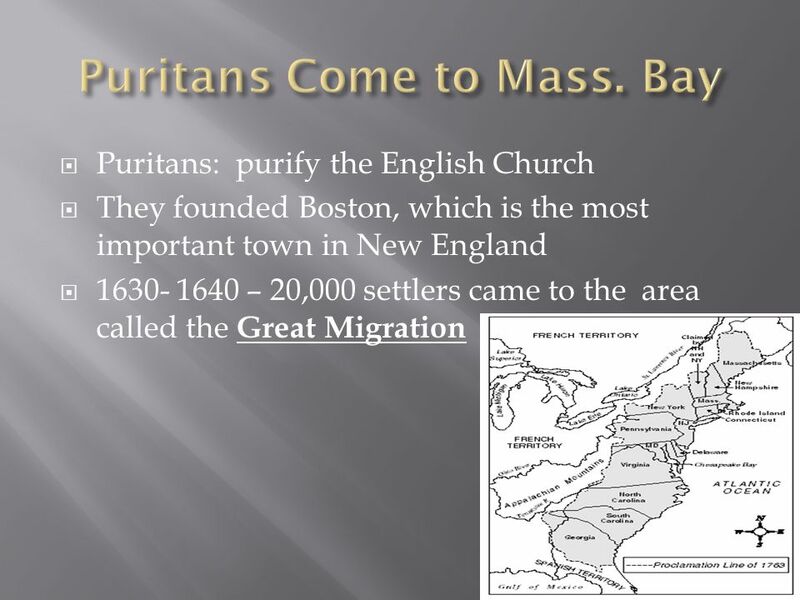 Puritans felt threatened and left Mass. 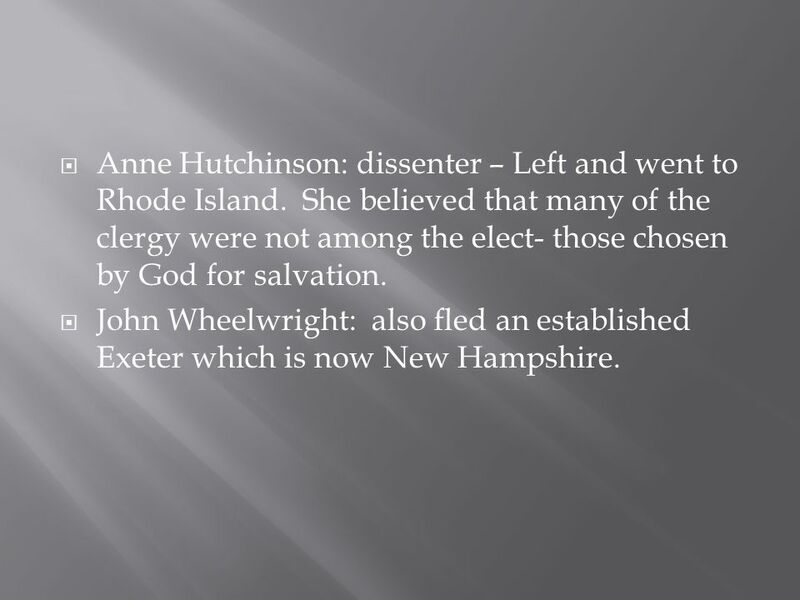 Anne Hutchinson: dissenter – Left and went to Rhode Island. She believed that many of the clergy were not among the elect- those chosen by God for salvation. 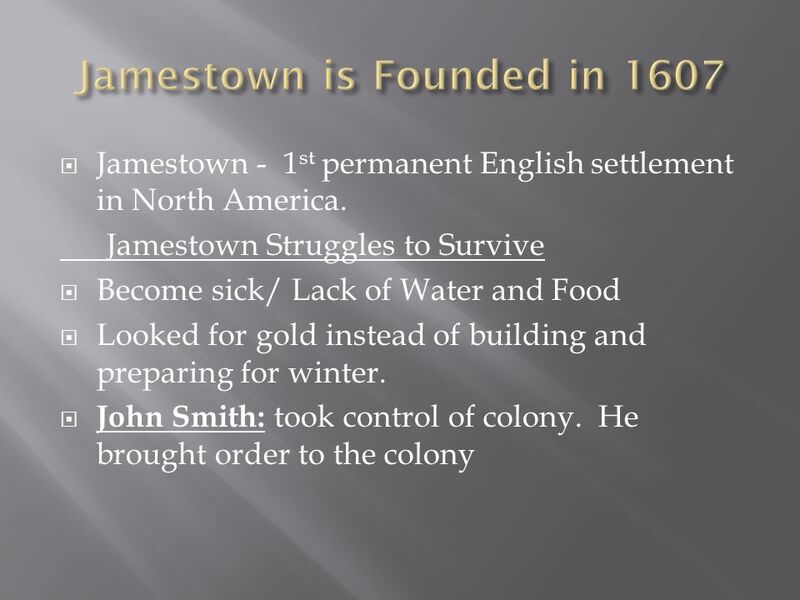 John Wheelwright: also fled an established Exeter which is now New Hampshire. 19 Martyrs: people who choose to die for a religious purpose. 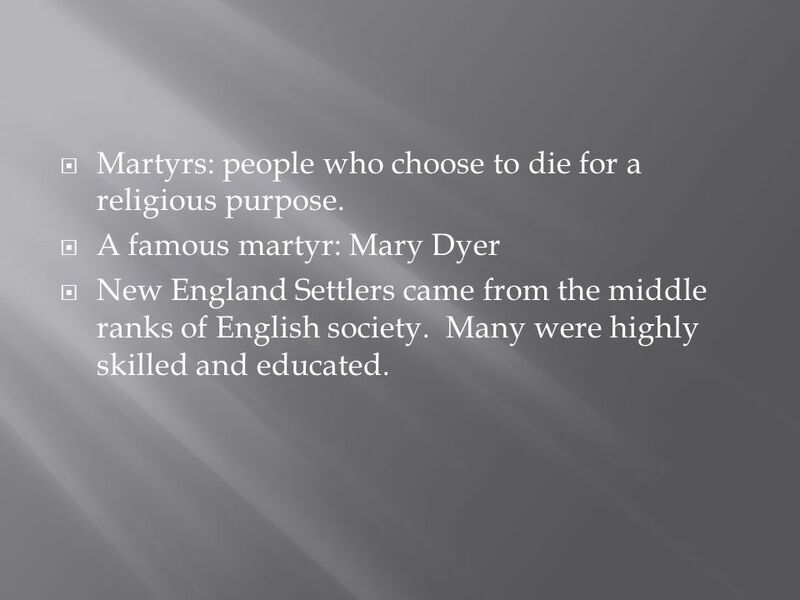 A famous martyr: Mary Dyer New England Settlers came from the middle ranks of English society. Many were highly skilled and educated. 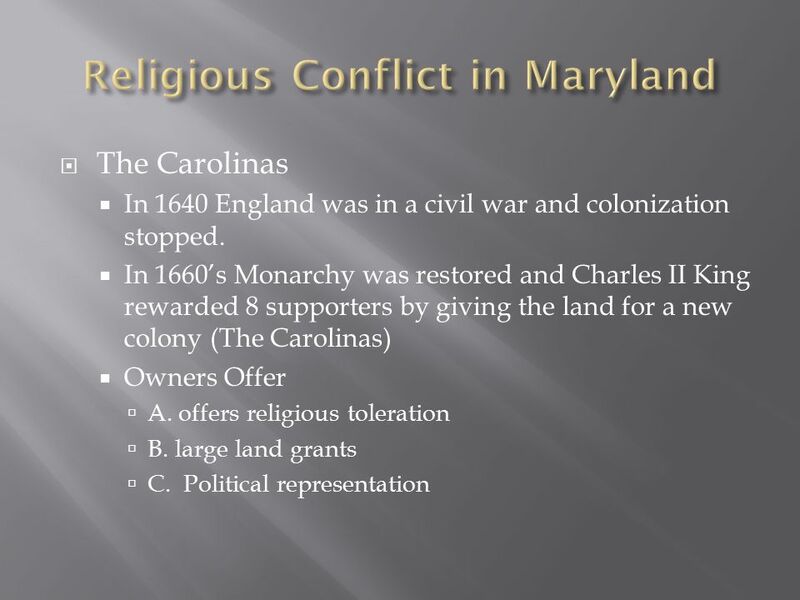 (1634) The second Southern colony was founded, Maryland. It was on the Chesapeake Bay. It was in tended to be a new society free from religious conflicts of Europe. 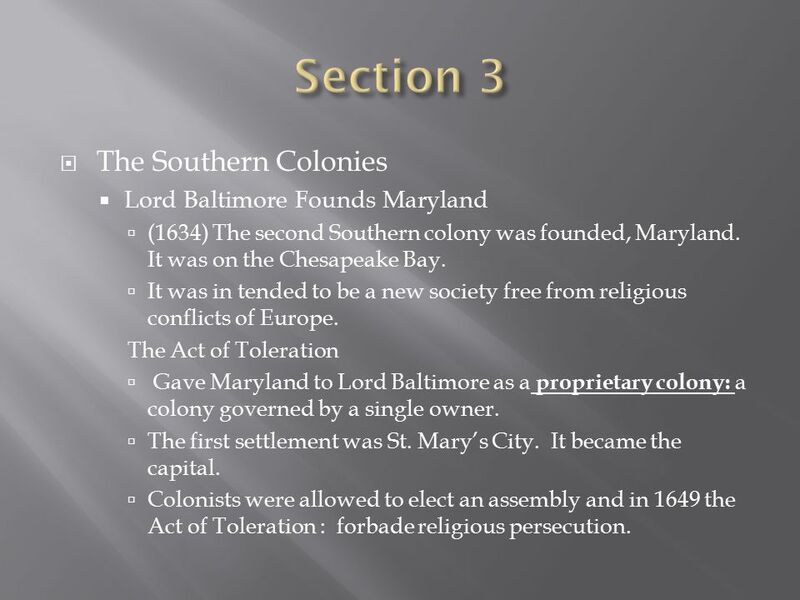 The Act of Toleration Gave Maryland to Lord Baltimore as a proprietary colony: a colony governed by a single owner. The first settlement was St. Mary’s City. It became the capital. 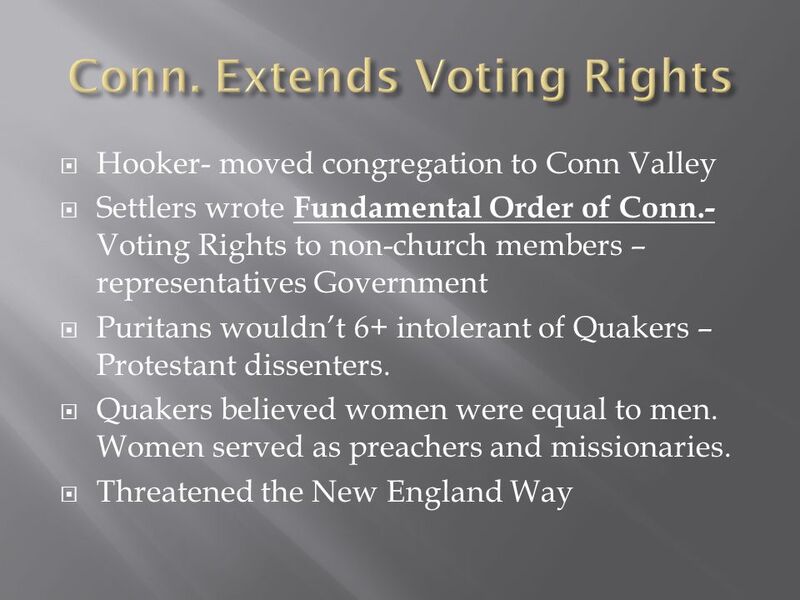 Colonists were allowed to elect an assembly and in 1649 the Act of Toleration : forbade religious persecution. 23 Charleston It was a refuge for Huguenots: or French Protestants who fled France. 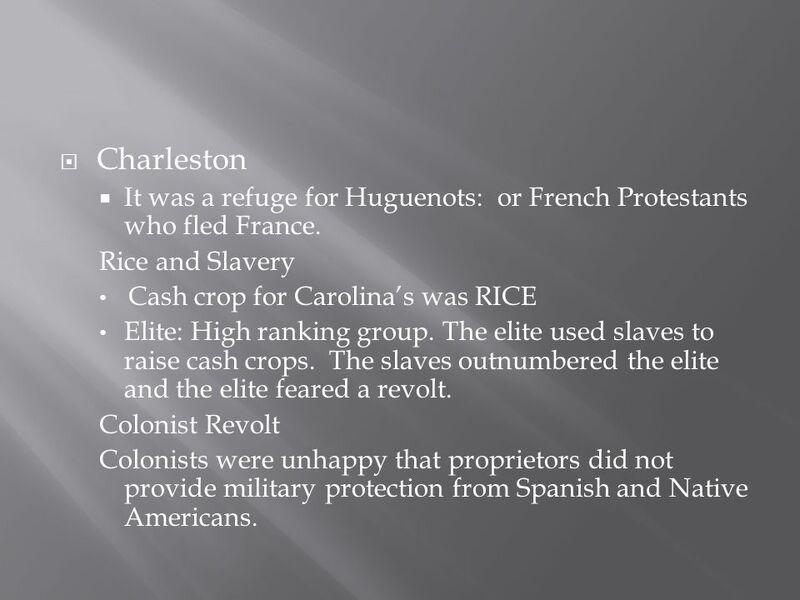 Rice and Slavery Cash crop for Carolina’s was RICE Elite: High ranking group. The elite used slaves to raise cash crops. The slaves outnumbered the elite and the elite feared a revolt. Colonist Revolt Colonists were unhappy that proprietors did not provide military protection from Spanish and Native Americans. 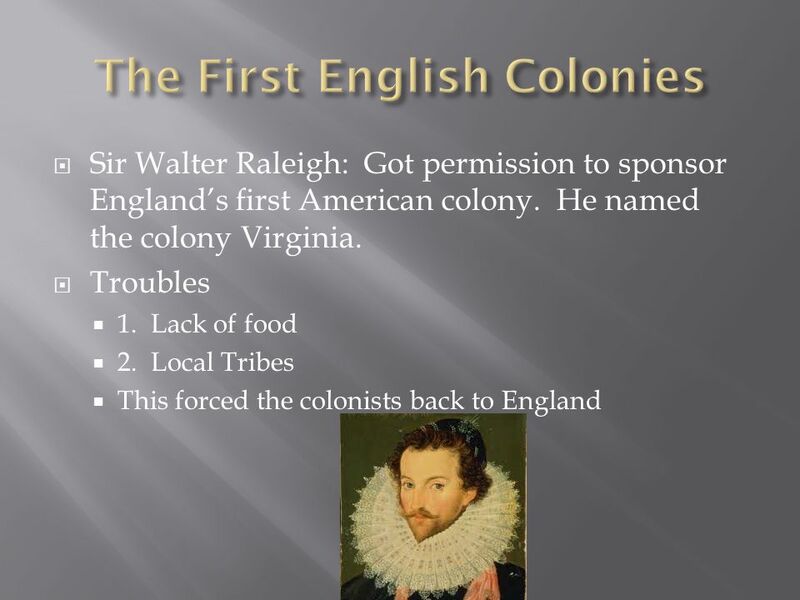 Colonists overthrew proprietors rule. 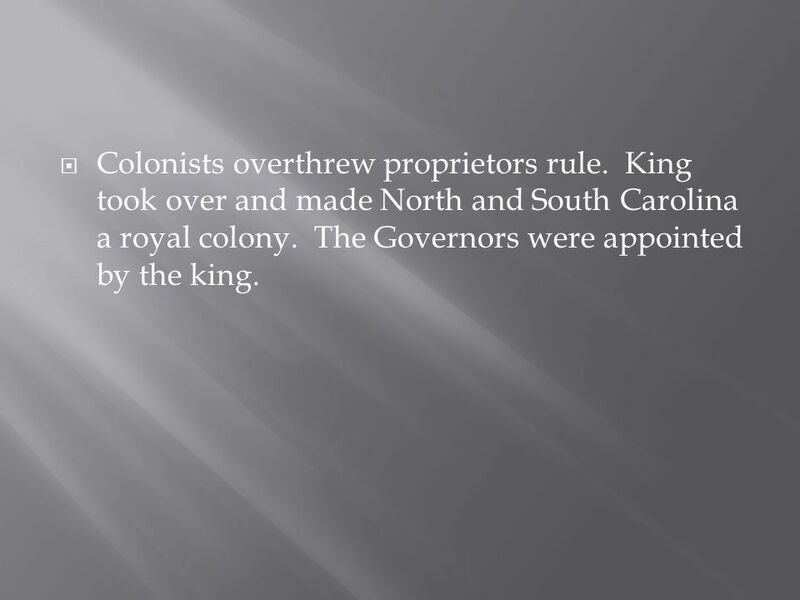 King took over and made North and South Carolina a royal colony. The Governors were appointed by the king. 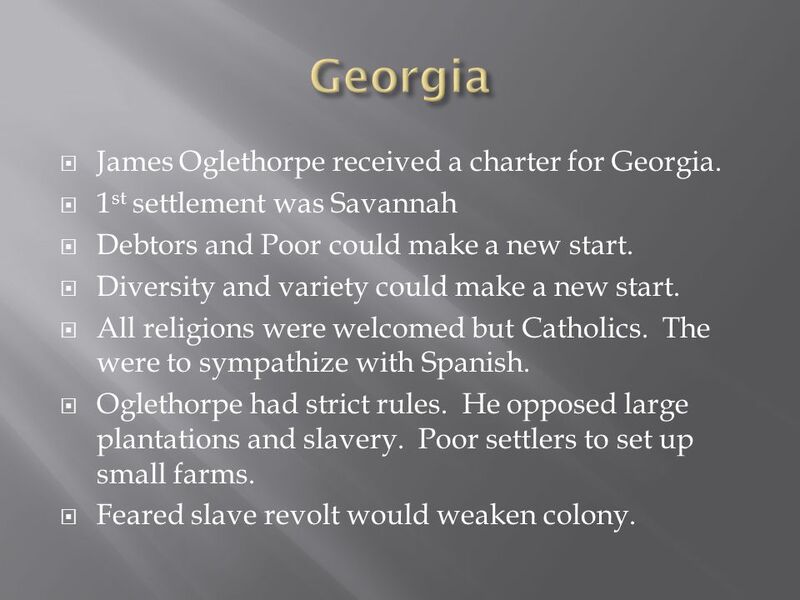 25 Georgia James Oglethorpe received a charter for Georgia. 1st settlement was Savannah Debtors and Poor could make a new start. Diversity and variety could make a new start. All religions were welcomed but Catholics. The were to sympathize with Spanish. Oglethorpe had strict rules. He opposed large plantations and slavery. Poor settlers to set up small farms. Feared slave revolt would weaken colony. 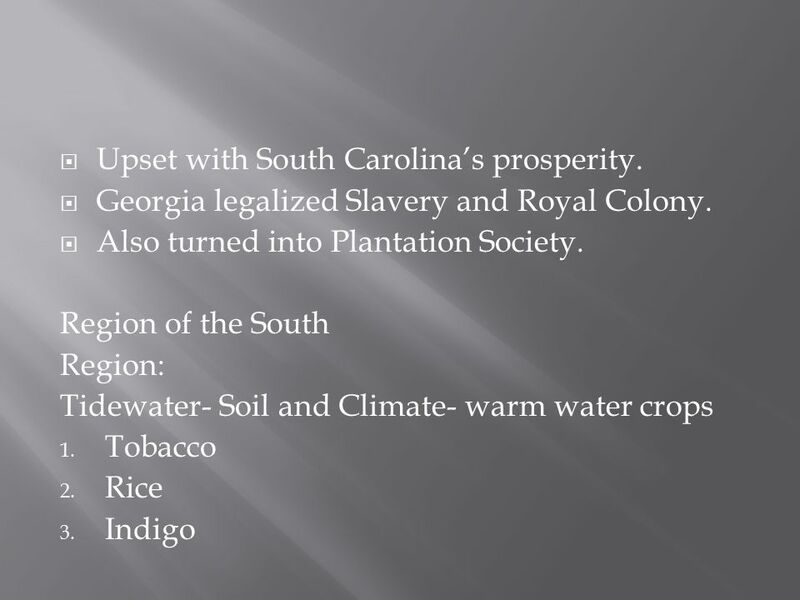 26 Upset with South Carolina’s prosperity. 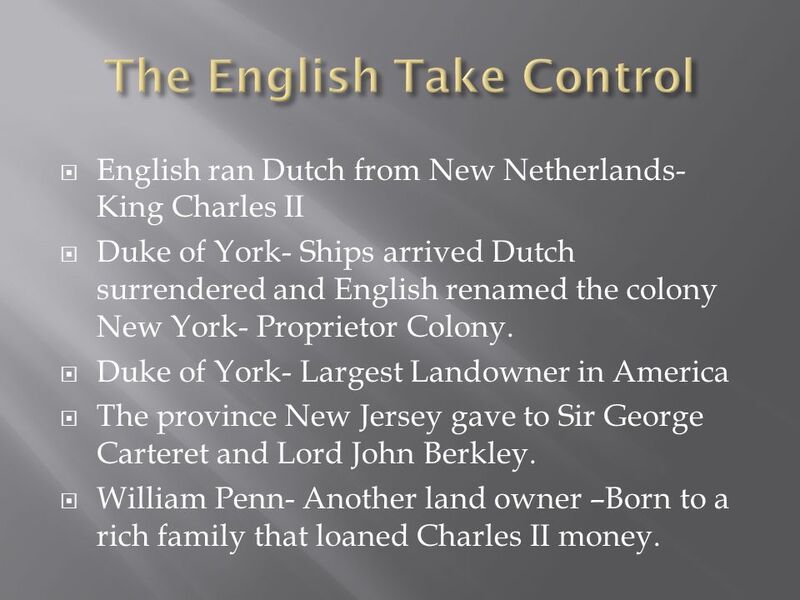 English ran Dutch from New Netherlands- King Charles II Duke of York- Ships arrived Dutch surrendered and English renamed the colony New York- Proprietor Colony. Duke of York- Largest Landowner in America The province New Jersey gave to Sir George Carteret and Lord John Berkley. 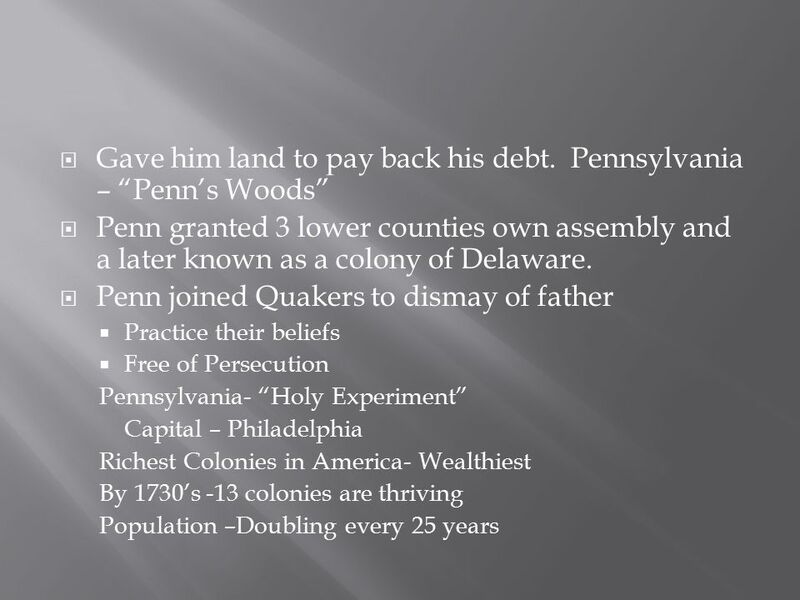 William Penn- Another land owner –Born to a rich family that loaned Charles II money. 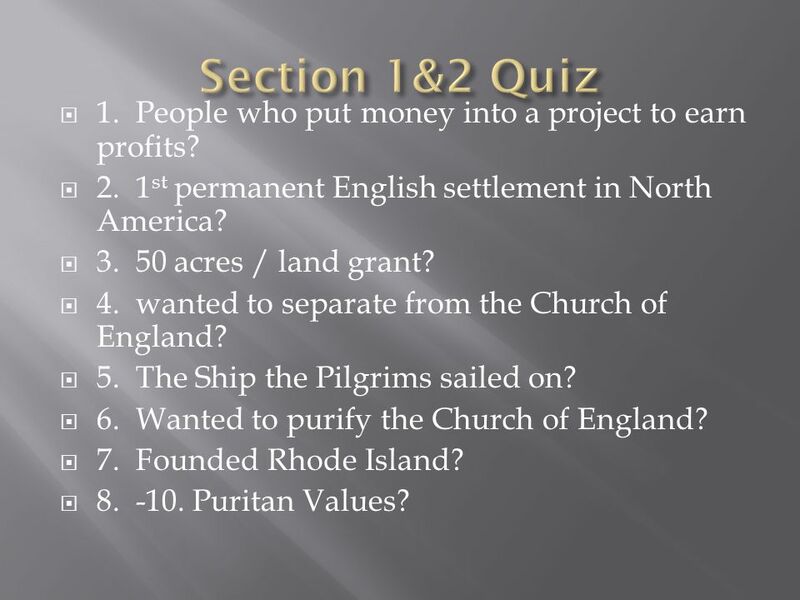 31 Section 1&2 Quiz 1. People who put money into a project to earn profits? 2. 1st permanent English settlement in North America? acres / land grant? 4. wanted to separate from the Church of England? 5. The Ship the Pilgrims sailed on? 6. Wanted to purify the Church of England? 7. 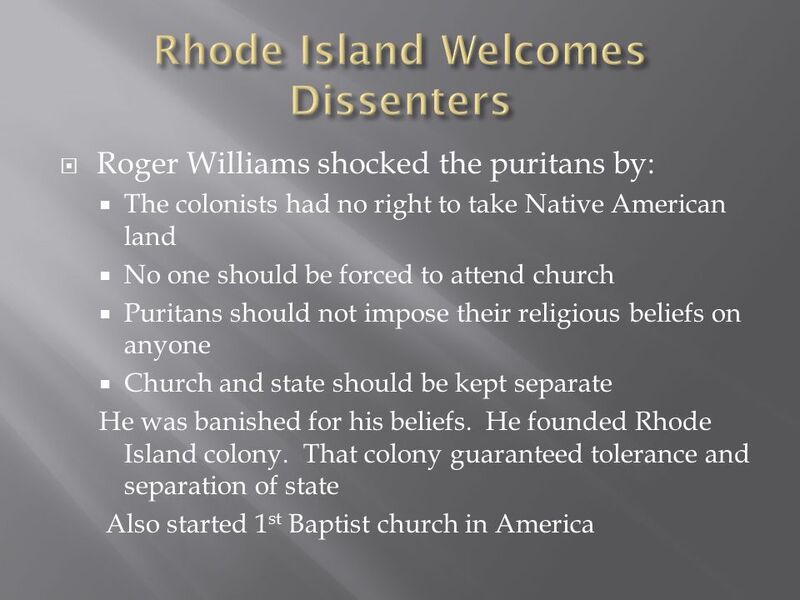 Founded Rhode Island? Puritan Values? 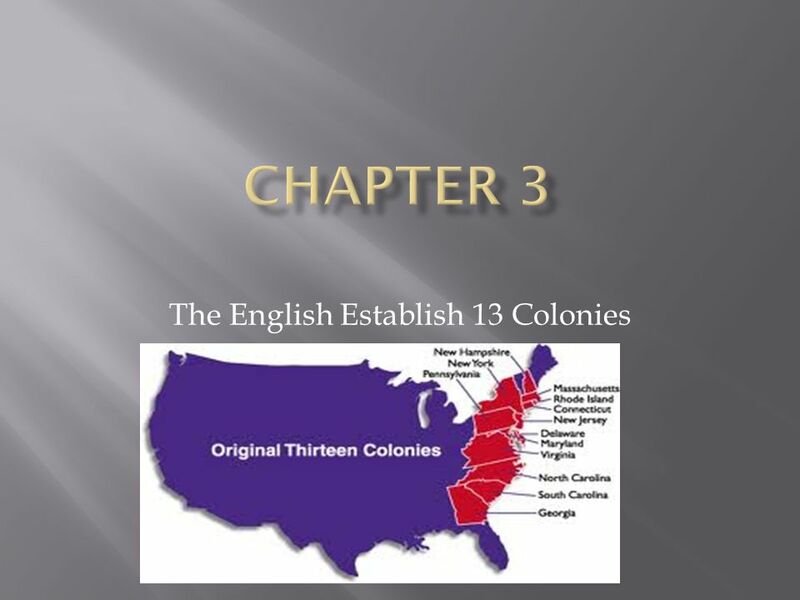 Download ppt "The English Establish 13 Colonies"
CHAPTER 3.3 MIDDLE AND SOUTHERN COLONIES. 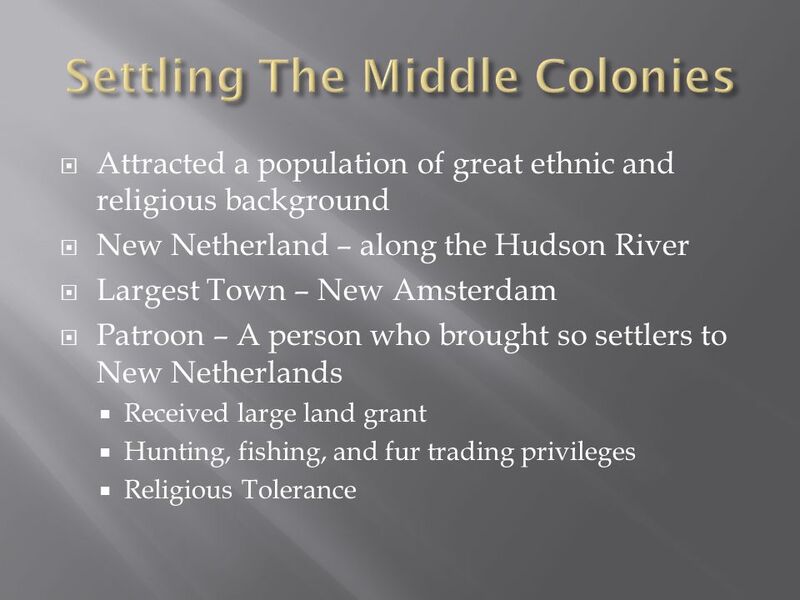 The Middle Colonies New York, New Jersey, Pennsylvania, and Delaware Swedes, Dutch, English, Germans and Africans.